The Daming Baochao paper money is made of mulberry bulk paper. The bill, worth 1,000 cash and measuring 36.4 ×22 cm, is the largest Chinese paper money. The Daming Baochao paper money is made of mulberry bulk paper. The bill, worth 1,000 cash and measuring 36.4 ×22 cm, is the largest Chinese paper money. There are six characters Daming Tongxing Baochao meaning "Great Ming paper money" on top of the face, two characters Yiguan meaning "1,000 cash" below, and an image of ten strings of copper coins further below, which is flanked by the words "Great Ming paper money" and "to be circulated all over the country". The note below the coin image says, "Great Ming paper money, issued by Ministry of Revenue with approval by the emperor, circulates along with copper cash. Any forger will be decapitated, and the informer will be awarded with 250 taels of silver plus the property of the criminal. Date, the reign of Hongwu." The bill is bordered with dragon and seawater patterns. In the eighth year of the Hongwu reign of Ming Taizu Emperor Zhu Yuanzhang (1375), a paper money standard was established, accompanied by a paper money bureau and a paper money law. 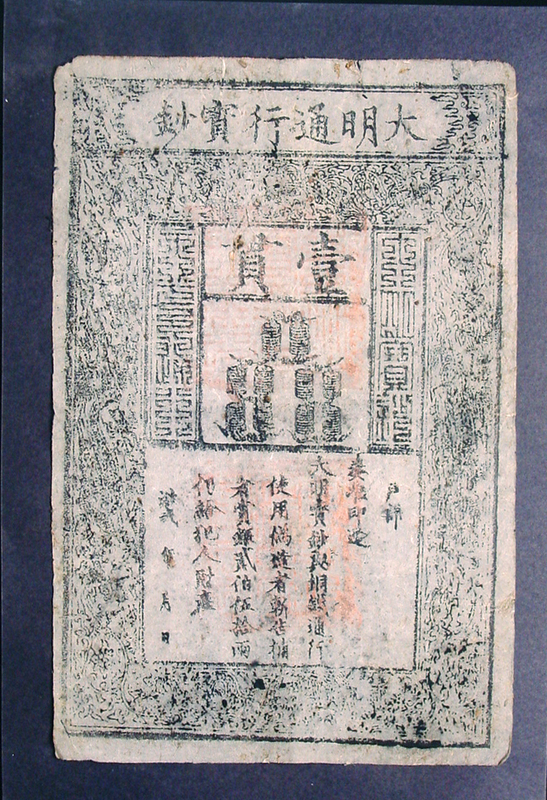 Great Ming paper money, accordingly issued, was inconvertible. The Huangsong Tongbao coin, with its inscription not marking a reign title, were issued in the first year of Baoyuan reign of Zhao Zhen, Emperor Renzong in Song Dynasty (1038). This finely cast coin has a clear inscription in Jiudiezhuan script. 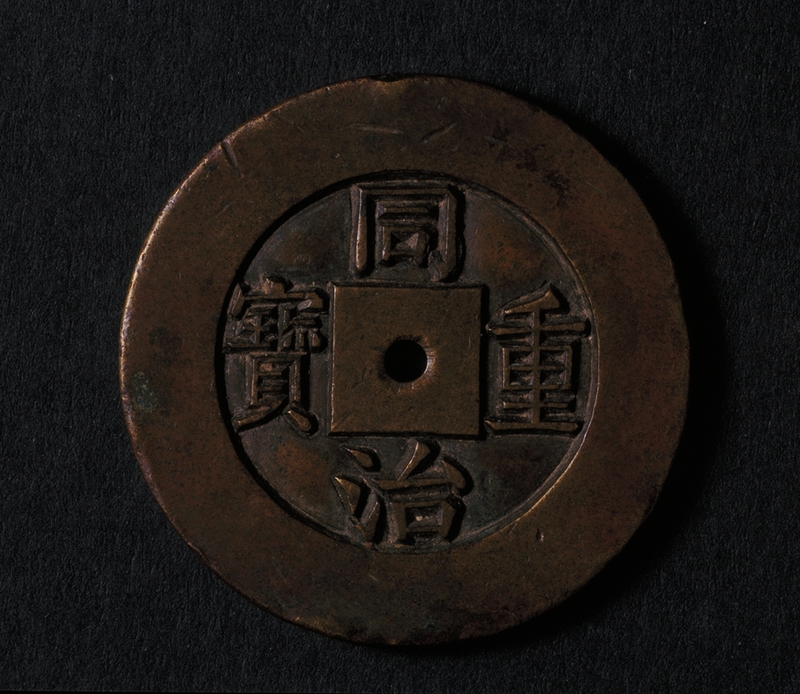 The Huangsong Tongbao coin, with its inscription not marking a reign title, were issued in the first year of Baoyuan reign of Zhao Zhen, Emperor Renzong in Song Dynasty (1038). Many of such coins have been handed down because they have circulated over a long period of time. 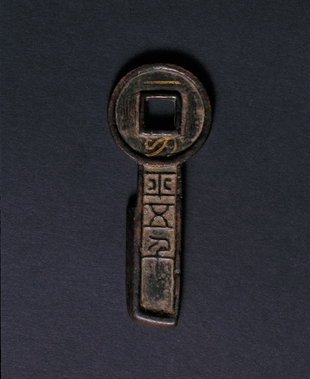 Most unearthed or handed down items bear inscriptions in regular script or seal script, while the Jiudiezhuan script is quite rare, which usually appear on seals or paper money in Song and Yuan dynasties. It is found on no other coins in the history but Huangsong Tongbao coins. It is generally believed that this coin served as a trial-cast example or an auspicious article for praying for successful casting rather than a currency. The Daqing Baochao paper money was issued in the third year of Xianfeng (1853). It has various values measured in terms of copper cash. The Daqing Baochao paper money was issued in the third year of Xianfeng (1853). It has various values measured in terms of copper cash. The four characters Daqing Baochao on top of its face means "Great Qing paper money", which are flanked by the words "to be circulated all over the country for fair transaction". On both sides of the square frame in the middle are characters indicating the serial number and the year in which it was made. In the middle is a printed picture of a number of standard copper coins stamped with a seal saying "Great Qing paper money". Below that is a note saying that the paper money could be used in place of copper cash for paying all sorts of taxes, that it was recognized by all tax bureaus outside Beijing, and that two thousand copper cash could be exchanged for a paper bill worth a tael of silver. 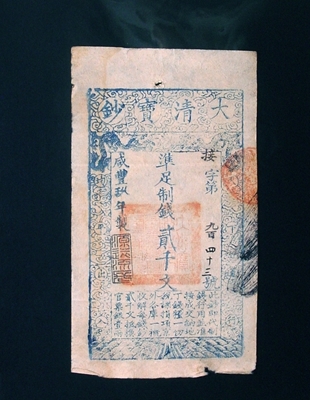 Imitating Great Ming paper money, the bill is bordered with a dragon pattern with a wavy pattern beneath. It is made of kraft paper, with characters and patterns printed in blue. Such bills were issued from the third to the ninth year of Xianfeng's reign. This is a big copper coin worth ten cash, with characters in a vigorous style. Red rust could be seen. This is a big copper coin worth ten cash, with characters in a vigorous style. Red rust could be seen. The Khitan characters on the obverse read Tianchao wanshun or Tianchao wansui. It used to be in the collection of Zhou Zhaoxiang, a collector of antiques. This coin is a copper prototype, being slightly bigger than coins modeled on it. This coin is a copper prototype, being slightly bigger than coins modeled on it. It is made of top-quality copper with a fine workmanship. It has a clear edge and characters with slender but vigorous strokes. The central square hole is not drilled through, only left a round hole in the middle. On the obverse is a regular-script inscription. 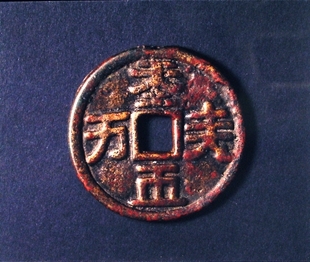 On the reverse are two Chinese characters meaning ‘equivalent to ten cash above and below the hole and two Manchu words on the left and right. 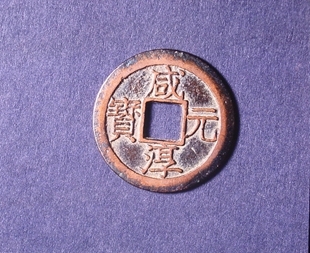 Made by hand, prototype coins (diao mu) were of the highest value among ancient coins. 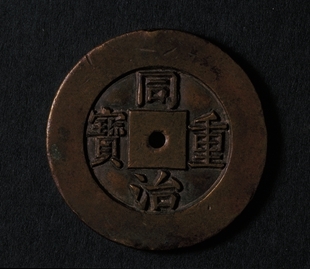 The Xianchun Yuanbao coin is a "master coin", a model directly sand-cast from the prototype for mass production of coins. The Xianchun Yuanbao coin is a "master coin", a model directly sand-cast from the prototype for mass production of coins. Though slightly inferior to the prototype, it is still of an exceptionally high quality in material and workmanship. This coin is made of first-rate copper, with a clear, elegant inscription and a fish-back-shaped edge that give it a high aesthetic value. Xianchun Yuanbao is the name for coins made in the reign of Xianchun (or Emperor Duzong, 1263~1274) in Southern Song Dynasty, which have three kinds of values, with regular-script inscriptions read vertically and their undersides marked with the years in which they were made (from "the first" to "the eighth"). 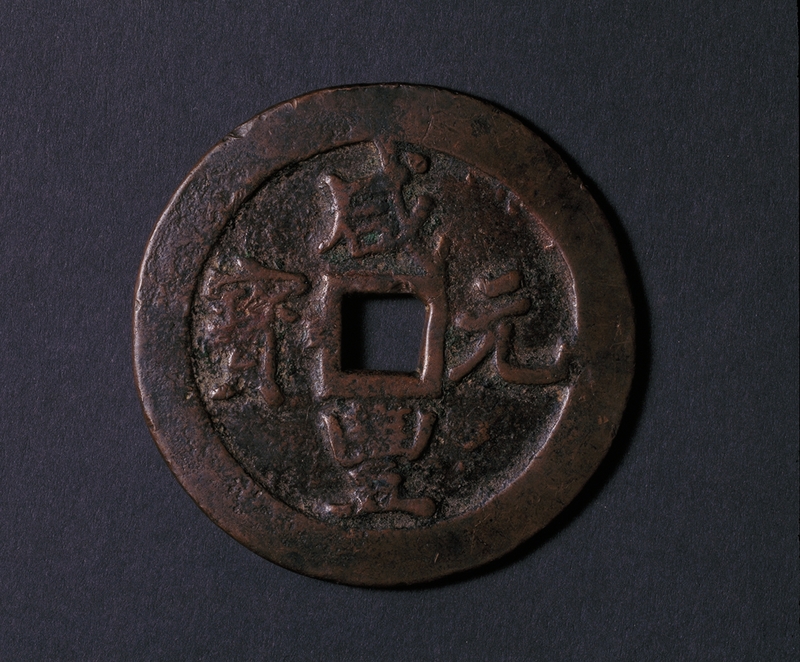 Since no coins were made from the reign of Emperor Gongdi to the end of Song Dynasty, this was the last kind of square-holed round coins made in the dynasty. The coins have regular-script characters Xianfeng yuanbao on the obverse. The coins have regular-script characters Xianfeng yuanbao on the obverse. On the reverse are the Chinese characters dangqian (equivalent to 1,000 cash) above and below the hole, and the Manchu words baogong on the left and right. In the reign of Xianfeng, common coins were called tongbao, coins worth four to fifty cash zhongbao, and coins worth a hundred cash and above yuanbao, with as many as five grades of value. In the fifth year in the reign of Xianfeng (1855 AD), the mint in Gansu produced seven types of coins with various values, shapes and sizes and widely different weights. These two coins are exquisitely wrought, with elegant inscriptions. They are of high value because the mint had produced very few dangqian coins. This knife-shaped coin is made of bronze and consists of a ring and a "blade". This knife-shaped coin is made of bronze and consists of a ring and a "blade". The ring is shaped like a round coin with a square hole, with two incised seal characters yidao in gold inlay above and below the hole. There are three molded characters in relief ping wuqian, or "equivalent to five thousand wuzhu coins", on the blade. Together the five characters mean that one knife-shaped coin was worth five thousand wuzhu coins (coins weighing one twenty-fourth of a tael each). 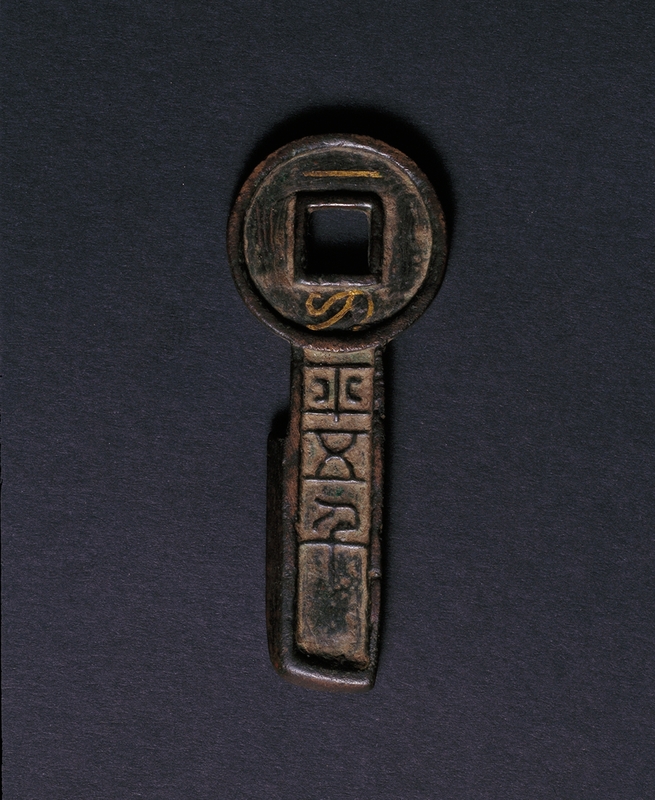 This is one of the knife-shaped coins made in 7 AD, or the second year in the reign of Wang Mang, who tried to revive ancient traditions. 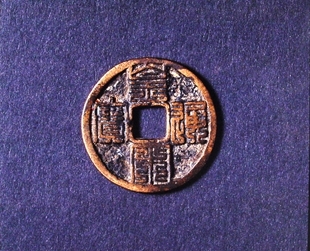 Wang Mang coins are favored by collectors for their high-quality bronze, unique style of inscriptions and striking shapes.